Karjat is located close to the basin of the river Ulhas, which is one amongst the popular weekend getaways from the city of Mumbai. The place offers a scenic natural beauty which is filled with moutains, forts and ancient rock cut cave temples and is a very popular jaunt for trekkers. Located at a distance of 68 km from Mumbai, the place's main attraction its climate and scenic beauty which makes it a one stop destination for adventure sports like rappelling, river rafting, trekking, waterfall climbing, etc. Best Time To Visit Karjat: Karjat is a year round destination. By Train: The major railway station is the Karjat Station which is well connected to all the major towns and cities across the state and has regular trains to Pune and Mumbai. By Road: One of the best ways to reach Karjat is by road. The town is well connected by roads and there are regular buses which operate from major cities to Karjat. The total driving distance from Mumbai to Karjat is around 62.3 km and one can reach the place by taking the Bangalore-Mumbai highway, which would take you about 2 to 3 h to reach the destination of Karjat. Navi Mumbai is often considered as a perfect mid way stopover to grab a glass of hot tea or some hot vada pavs. Being located on the Konkan coast, Karjat is home to a beautiful environment, which emcompasses the Bhor Ghat in its milieu and also the blossoming green vegetation. Karjat has indeed become a quaint tourist destination which is also considered as a gateway to the hill station of Matheran. The Ulhas Valley is a very popular spot here. The valley is well known for its greenery and cascading waterfalls. 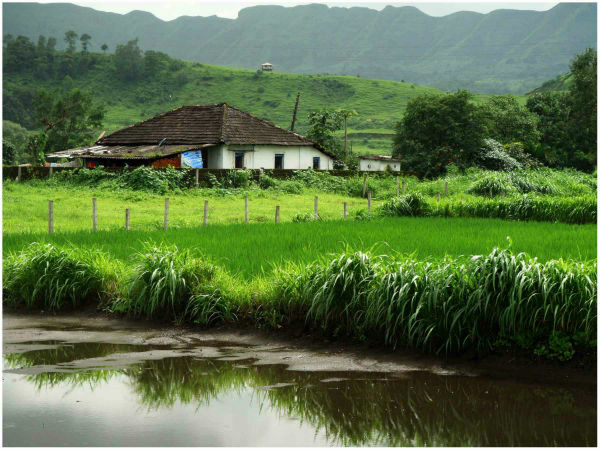 During monsoon, the valley offers a magnificent view of the surrounding - waterfalls, lush greenery and the gushing streams of the Ulhas River. Kondana caves is another major draw here. Carved with delicately beautiful intricacy, these caves exude a regal aura. The beauty of these caves are enhanced by the bubbling waters of the nearby waterfalls and is at its peak during the monsoon season. These caves with several stupas and sculptures offer a glimpse into the ancient lifestyle of the Buddhist monks. Featuring dancing men and women, the embellishments here are held together by massive octagonal pillars. Each and every corner of these caves is graced with amazingly detailed craftsmanship and is a bedazzling experience. The Bahiri cave in Karjat is famous among adventure junkies, trekkers and nature lovers. The wide stretches of the cave offer a challenge to the trekkers. The trekking route is narrow and the trekkers have to be careful while descending or ascending.